Practical experiences We have lived in the house since Mars 11 2011. We have experienced several winter periods so far and are very satisfied with it. You can read about some of our experiences further down. If you want to comment or ask questions abot the house, please feel free to mail us by clicking here. Click on picture for a larger. 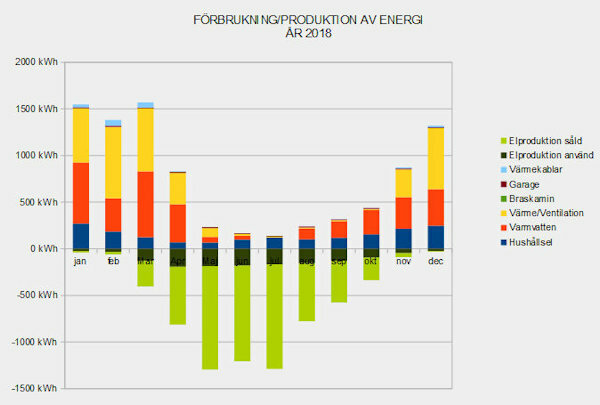 Sweden is rather cold during winter season, which normally makes the cost for heating buildings high. We assume this cost will increase a great deal in coming years. During the years 2008 - 2011 we have built a so called passive house in Härryda, Sweden. A passive house is a building with very good insulation and planned in a way that the need for energy for heating will be minimized. I e there will be no heating radiators installed. You can look upon it as a thermos. But even a thermos will loose energy after a while so energy has to be added in some way. This will come from sun radiation, people, lights and other equipment that produces heat like deep freeze, fridge and an electric towel dryer. All this will make the rooms hold an ordinary temperature. An electric heater (1800 W) combined with a heat exchanger in the ventilation system will give some contribution. We have also installed a small fire place which we may use the coldest days. Both building shell and facade are wooden. The outer walls are built up by a double system of joists and mineral wool with a wide unbroken layer of mineral wool between. Insulation is 500 mm thick or more throughout. The roof will 300 mm cellulosa insulation plus 45 mm mineral wool. Foundation is a reinforced concrete slab with 300 mm thick cellular plastic insulation under. The house is equiped with balanced ventilation system with a heat exchanger and an electric heater. Airtightness in the climate shell is therefor very essential. 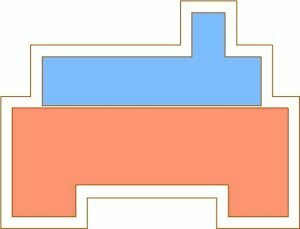 To avoid puntation of the diffusion barrier by electric cables they will are installed in a layer of 45 mm joist/minaral insulation inside the diffusion barrier. Foundation has been a lively discussed item. At last we decided for a slab on 300 mm thick cellar plastic from two essential reasons. First, a very well insulated house with crawl spase may get damp problems in the bottom slab. Second , A crawl space makes the house half a meter higher causing problems at entrances and makes the house look too high. Floor i ground floor is mainly 14 mm oak parquet floating on 50 mm cellular plastic. Lavatory, toilet, shower room and entrance have tiled floor on so called EPS concrete (concrete with cellular ballast). Second floor has 22 mm thick oak parquet of the same look as parquet in ground floor in living rooms. Most walls are 15 mm thick pre painted panel. Wet rooms have tiled walls on humid board all way to roof. Indoor roofs have the same panel as the walls all over. Outdoor panel is 25 mm thick spruce painted with vitriol. They will be grey within a few years. No joints even on the longest panels (7.5 metres). Chimeny is built of brick to serve as a warmth reservoir. The building is placed with one long facade facing south. In the south side of the house are sleeping room, living room and studio. This side has big windows. In the north side are kitchen, toilet, lavatory, store rooms and room for neccesary apparatus. This side has very small windows. The facade of the living room is retracted about 6 feet. As a cover for strong summer sun the roof stretches over half the terrace. 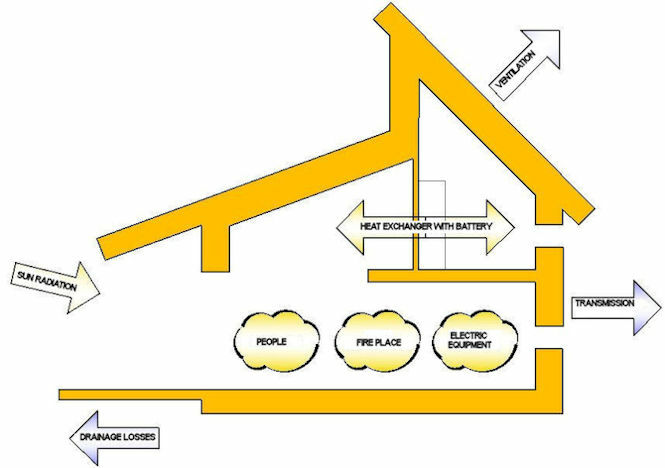 Energy from the house is lost via transmission through the surrounding building shell, ventilation and hot water through drainage. 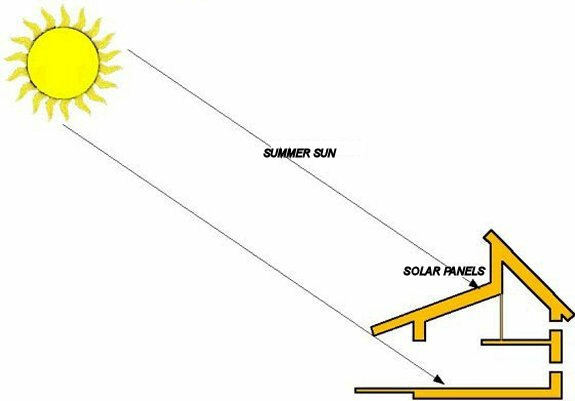 Energy is supplied via sun radiation, through peoples activity in the house and waste heat from technical apparatuses and electric equipment. Energy is also supplied by heat exchange in the ventilation installation with an electric heater included (1.8 kW). Still more can be supplied by a small fire place in the living room and an electric towel dryer. Ventilation equipment consist of an unit set including heat exchanger and a heater (REC Indovent type RT 400S-EC) and pipes. In the pipe system is included sound absobers (4 each with a length of 1 metre). There are also adapted flexible silencers to all nozzles. Hot water will be produced by solar panels on the south side of the roof during summer. The sun collectors are Swedish made, Lesol. The accumulator tank contains 750 litres of water. It is insulated with 180 mm mineral wool all around. Heat from the solar system is taken in at the bottom of the tank. When heat in the top is under 56º C an electric emmersion heater will take over. Floor heating has been a lively discussed item. We are fully aware that most people want floor heating in a house with this type of foundation. To make it easy for coming owners we have installed floor heating in all rooms with tiled floor. The heat pipes are connected to the accumulator tank via a pump. This means we have free floor heating under the sunny season. 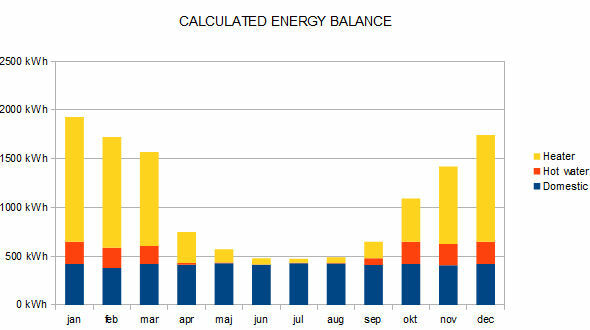 You can follow our energy consumption and weather statistics in our diary. Late 2013 we had 63 m2 solar cell panels installed on the south side of the main building. The capacity is 9.25 kW and gives about 6 200 kWh per year. Governmental economic support (35% of production cost has helped to make this installation possible. We register the electricity production here. The window embrasures have an angle of 30º on the sides to get a better light. They are painted white and I can say it has become very effectful. All light bulbs are of so called LED type. Total effect for all installed lights in the house is around 200 W. The price for LED equipment is still high, but at least we will not have to exchange bulbs during our lifetime. Light color is now good. The indoor climate is very good. Room temperature is pleasant whether it is cold or warm outdoors. It looks like domestic consumption is about 7 kWh per day, which means around 2500 kWh per year. this seems to be a bit low, maybe because we are a small family. Domestic consumption includes all summertime consumption but ventilation pump, i e kitchen equipment, lavatory equipment, pumps, lighting towel dryer, charging for computers etc. Sunny summer days temperature in accumulator tank reaches 110º in all three levels. At the moment floor heating is only on in shower room and the toilet. We have used floor heating in these rooms all winter. In fact we have only used floor heating in 1 other room, entrace, for a few days. As we have a big air volume in the house the ventilation heater has not been able to keep temperature at 20º C during the coldest periods. We have used the fire place about 2,5 hours every second day during that time. From a house planning point of view kitchen and lavatory sizes ar rather small for a bigger family. As we are only two persons in the family and the air volume is big. All equipment in apparatus room needs room. There are, beside the big tank, water filter, hydrofor, two expansion tanks and the ventilation equipment. We are extremely satisfied with the air and the open plan in the house as well as the light impression from the interior. Photos do not make it full justice. Up to that we have a wonderful restful environment. Of course energi saving is part of our life style, but we do not feel like having to adopt our way of life to the house. It is rather that we have got a higher life quality.